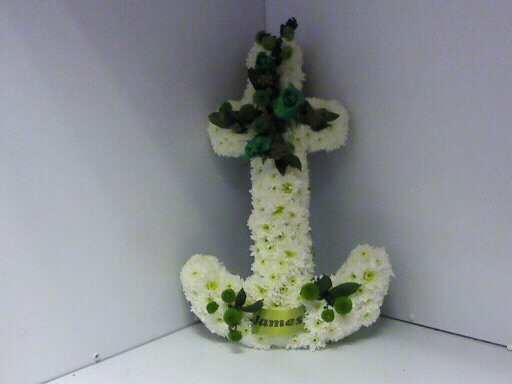 Funeral tribute in the shape of an anchor with flower placements. Very popular tribute for anyone that has been involved with the sea or boats. All funeral tributes comes with a hand written card for that extra special touch. This tribute is based in white chrysant fresh flowers. It has placements of fresh flowers which can be done in any colour and a variety of flowers. Can also have a personalised ribbon with a name or message of your choice.